Head protection is a snap. 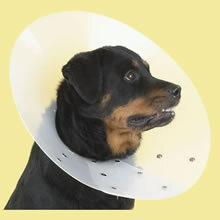 Protect pets from self-inflicted scratching, licking and biting of the eyes, ears, abdomen and feet. Animal professionals will favor using this collar to help sale item as well. These durable, reusable shields are made of flexible polyethylene with stainless steel rust proof snaps. The feature a rubber-foam comfort cushion cover around the neck area that won't wear or deteriorate. Available in various sizes.